Today, we continue our examination of our city's leaders—the chief executives of Newark from the late 1870s through the dawning of a new century. William H. F. Fiedler was the 18th mayor of Newark (1880-82). He also served as an assemblyman, congressman and postmaster of Newark during his 40 years in political life in the Democratic Party. Born in New York City, he became prominent in the business world after moving to Newark. And being a German in a city that had a growing German-speaking population certainly did not hurt his political fortunes. In 1853, a group in the German community petitioned the predominately non-German council for more liberal enforcement of the Sunday blue laws, which did not take kindly to the city's many German singing societies and was not tolerant of their beer-drinking customs. The petition was denied and opposition continued to grow until a July 1879 mass meeting attracted 3,000 German-Americans asking the same question. By September 1879, 10,000 to 12,000 of them formed a parade with several floats and 500 wagons to protest 'the tyranny of the law-and-order people.' Time had come for a German-American mayor. Fiedler rode into office by a majority of 3,400 votes. Once in power, he paid particularly close attention to municipal financial inconsistencies, and unearthed a series of financial scandals involving the city auditor and his chief clerk. The problem was quickly rectified. Fortunately for Fiedler, and other top Newark officials, President Grover Cleveland appointed several of his associates to federal positions. Fiedler became Newark's postmaster after leaving the mayor's office in 1885. However, his candidacy for consul to Berlin or Hamburg unfortunately was denied. The mayor's earlier business career as a hatter and clothing manufacturer gave way to a series of real estate investments with the formation of the Fiedler Corp. In 1890, he was one of the organizers of the U. S. Credit System Co. He also was one of the builders of the Metropolitan Building, an important downtown office building on the site of the old Bamberger's department store at Market and Washington streets. The many social organizations to which he belonged included a number of Newark's famed German singing societies. While German-American to the core, Mayor Fiedler had a substantial role in the city's golden age of the American century. Henry Lang was the 19th mayor of Newark (1882-84). Born in Barr Head, Scotland, in 1829, he came with his parents to America in 1833, settling first in New York City, where he attended school until his 15th birthday. Lang became a leather dresser in John R. Cockett's Newark leather works, moved to Portland, Maine, where he established his own business four years later, and then returned to Newark to establish a company in Plane Street (University Avenue). In 1877, he was elected to the Common Council. He resigned in 1881 to assume the position of mayor. One of his first acts as the city's chief executive was a street-wise one. He had Broad Street from Lincoln Park to the Stone Bridge, and Market Street from High Street to the Market Street Depot paved with granite blocks. The project was paid for out of regular tax revenues rather than a special bond issue. Work was to be done in sections and paid for as completed. 'Probably no improvement ever made in the city (to that time) has given such satisfaction,' one writer said at the time. Lang also was greatly concerned about issues of public health and with the prevention of sickness and pestilence. This he accomplished by increasing the power of the Newark Health Board. His other major interest lay in improving education and enforcing school attendance of children in the public schools. Moreover, he promoted evening schools 'and did all in his power to prove their usefulness.' Lang also was a director of the German National Bank and an active member of the Board of Trade. He accomplished much in a short administration. Joseph Emmett Haynes, 20th mayor of Newark (1884-94), was born in Westford, N.Y., in July 1827. He made enough money to put himself through school and become a school teacher in Irvington before becoming principal of the Morton Street School, a position he occupied for 32 years. 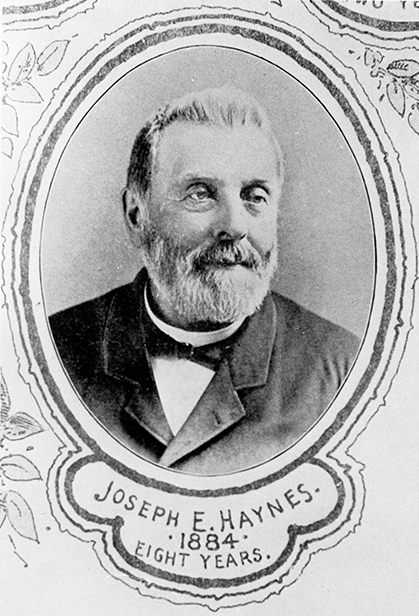 Haynes was from the working class, a supporter of the growing Irish and German immigrant communities. Referred to by his adversaries as 'Picnic Joe' because of his love of outings, he fought his detractors with his intelligent and witty speeches. When elected mayor in 1884, Haynes stepped into the biggest controversy facing Newark in some time—providing the city with a fresh water supply. 'The importance of an abundant supply of pure water cannot be overestimated. That from the Pequannock seems the most feasible and best adopted to meet the requirements of our city for the present and having a due regard for the future,' historian John Cunningham subsequently wrote. 'The time has come to act.' With the purchase of the East Jersey Water Co. for $6 million, three reservoirs—Oak Ridge, Clinton and Macopin—were built. Twenty-one miles of 48-inch pipe brought fresh water from the Pequannock into city faucets by 1892. Haynes' gamble worked, providing good water for the population and for Newark's diverse industrial needs. According to Cunningham, the mayor's lasting monument was our water system: 'All Newark civic accomplishments of the late 19th century pale beside it—both because of the need for water and the daring solution that Haynes supported at the risk of political ruin.' The barbs of 'Haynes Folly' and his hanging in effigy at City Hall appeared ridiculous in light of the success of the venture. His other contributions, including the development of parks and the relocation of the Old Burying Grounds, were important, too, but the creation of one of the nation's best municipal water supply systems turned from folly to memorial. The next time you are driving along Routes 1 & 9 and see the sign pointing to Haynes Avenue, you will know who and what it signifies. Haynes, his 19 predecessors and the aldermen who served on the Common Council during Newark's early days shaped the basic structure of the modern city. Just a few of the mayors were born here. Some came from New York City. Others came from Scotland, and one was the grandson of a Frenchman escaped from revolutionary Paris. Their backgrounds were even more varied than their birthplaces. They were patricians, labor leaders, representatives of national political groups, clerks, bank presidents, teachers, authors, librarians, college presidents and a poet. Many of them held other elected offices at the municipal, state, and national levels. Together, they paved Newark's streets, provided the city with excellent water, saw the construction of an outstanding school system, encouraged the creation of a nationally known library, helped lay out a park system and oversaw the emergence of nationally known and respected police and fire departments. They prepared Newarkers for the rigors of the century to come with its wars, boom and bust economy, national riots and hope for better times.